Pups are said to have the kindest and the bravest of the hearts. There are a number of stories prevailing about their loyalty and bravery that cannot be matched by any human friend. These fur balls live with a zest of giving love to us till they take their last breath. In return, it is our responsibility to take care of these loving creatures and protect them from pests and heartworms. Heart worms are one of the most dangerous parasites that could kill your four-legged friend. If you live in tropical regions, then there are higher chances of heartworm infection in your pooches. Tropical regions are warmer and highly populated with mosquitoes. Heartworm infestation is the result of a mosquito bite which had already bitten an infected dog. Once your pup gets infected with heartworms, its treatment can be costly for you and painful for your pup. So, in case of heartworms, prevention is always better than cure. Heartgard Plus for dogs is the most recommended preventive treatment to block these pests from your tykes. It is an oral treatment from the house of Merial. It can shield your canine from heartworms as well as its juvenile stages. The add-on of this treatment is that it also prevents your pet from intestinal pests like hookworms and roundworms. This chewable comes in a real beef flavor; your pup may love to eat it right out of your hand. 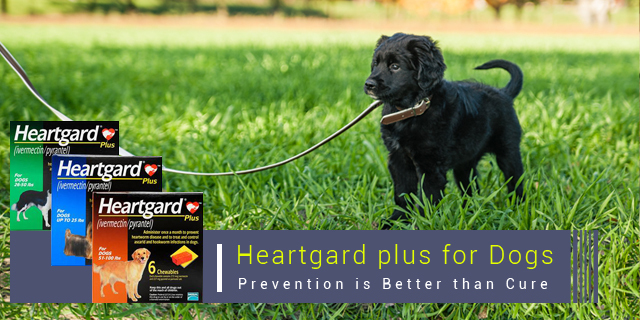 Heartgard Plus remains effective for a month and is safe to administer to adult dogs and puppies above 6 weeks of age. There are two active ingredients in Heartgard Plus, Ivermectin and Pyrantel Pamoate. Ivermectin is a broad spectrum anti parasitic component that works to prevent heartworm infestation whereas Pyrantel shields hookworms and roundworm infestation. So, all these pests can be blocked in a single chew. Isn’t it amazing? Why should you get Heartgard Plus for Dogs? From the pool of heartworm preventives, here are the reasons for why you should go with Heartgard Plus! The best advantage of this treatment is that it not only prevents your canine from heartworms but also shield him from hookworms and roundworms. So, one chew can fight three types of worms! This tasty chew also kills the tissue stage of larvae. Flavorless tablets can be harder to administer to your furry little pals. One sniff and they might run away. This chew has a mouth watering beef flavor that entices your friend to chew it. So, if you choose this preventive, there would be no runaway for your poodles. It provides a 30 days protection to your tyke. What are the safety measures that you should take before its administration? Heartgard Plus for dogs is not recommended to administer to puppies under 6 weeks of age. This treatment has Ivermectin as its key ingredient. Breeds like collies can be allergic to this constituent. So, it is advisable to check with your vet before its administration to such breeds. It is recommended to get your four-legged friend checked for heartworm infection before starting the administration of this chew. This treatment should be started only if he is not infected by heartworms as it is a preventive treatment. Wash your hands before and after its administration. Maintain a strict monthly schedule and see that you do not overdose your pooch. For the best results, this treatment should be continued to be given for 12 months. Let your poodle chew the tablet rather than swallow it. If he does not chew, try grinding the tablet and mix it with his food. To sum up, your sweet little friend can be safe and healthy if you are proactive in nature rather than reactive. 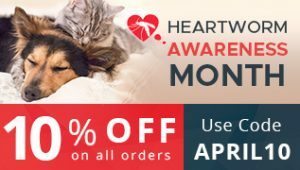 Prevent your fur balls from heartworms with heartgard for dogs before they get infected. Wouldn’t it be great if you could proudly say that “my dog has never been infected by heartworms!”? Well, start this heartworm preventive and you may be able to flaunt the health of your poodle.